2009 American Silver Eagle Bullion coins have sold out, the United States Mint announced late Tuesday morning. The remaining inventory was depleted earlier in the day, leaving Silver Eagles on the sidelines until Jan. 19. The US Mint reconfirmed today that the 19th is still the scheduled launch time for 2010 American Eagle gold and silver one ounce bullion coins. Unprecedented demand delayed the new year dated coins, which are usually minted in late November, sold to Mint authorized purchasers in late December and made available to an eagerly awaiting public in early January. The enormous demand was also responsible for the cancellations of the 2009-dated proof an uncirculated versions, which extremely upset the collecting community. 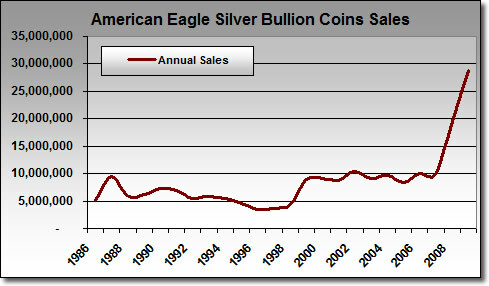 December was a huge month for the bullion eagles, which capped a year in which a record-breaking 28,766,500 were sold. The latest available tally for January Mint sales show another 367,500 were scooped up, bringing the total 2009-dated Silver Eagle bullion coins sold to just over 29 million at 29,134,000 — by far the most ever for the silver coin since it was launched in 1986. The 2009 figures would have been even higher had the Mint not run low of silver coin blanks, forcing several suspensions and then rationing throughout the year when they were available. Prior to last year, 2008 held the annual record for most coins sold, with 19,583,500. The US Mint sells bullion coins for a small amount over the current spot price of the precious metal within them, but only to authorized purchasers. They in turn resell the coins to coin dealers, precious metal providers and/or directly to the public. 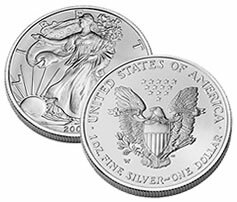 the mint website stated that 2008 american eagle silver dollar sold is 20,583,000. while yours is 19,583,500. which one is correct?. please verify it again. thanks. For the entire 2008 year, the US Mint sold 19,583,500 Silver Eagle bullion coins. However, in December of 2007 the US Mint began selling the 2008-dated coins to authorized purchasers, which is why the total for those year-dated coins is actually higher at 20,583,000.
so the final mintage for 2008 AGE should read 20,583,000 and for 2009 is 29,134,000.
second question. what about the gold. is 20,000 for 2010 is already included in the 2009 figure at 1,315,500. if so. the 2010 will be zero. just like the ASE silver. right?. Since the mint isn’t going to sell any 2010 $50 American Gold Eagle bullion coins to their authorized dealers until Jan 19, 2010, I don’t see how there could be any 2010 Eagles sold in 2009. 2010 $1 American Silver Eagle bullion coins go on sale (to dealers) the same day.